In 1986 Italy issued 2 stamps of composers, SG 1915-1916. Pergolesi (1710-36) is best known for his Stabat Mater, a moving setting of words about Jesus's mother standing by the Cross; he died at 26 from tuberculosis. Ponchielli (1834-1886) is most famous for an opera, La Gioconda. In 1985 Eire issued three stamps featuring classical composers born 300 years before: Handel, Domenico Scarlatti and J S Bach (SG 615-617). I will show a few stamps from the German Protectorate of Bohemia and Moravia. As Germany invaded Poland and Czechoslovakia in 1939, they established a puppet state in Bohemia and Moravia (today parts of the Czech Republic). Officially it was called a German Protectorate, but Czechs were brutally oppressed and used as labor to support the Nazi war effort. All and all a very brutal time in the history of Central Europe. Bohemia and Moravia ceased to exist with the surrender of Nazi Germany to the allies in 1945. These stamps featuring Antonin Dvorak were issued on August 25th, 1941. The stamps were issued to commemorate the 100th anniversary of the birth of the world renown Czech composer (1841-1904). 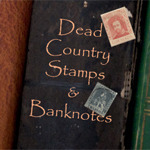 Note the attached labels, featuring a branch running across a harp, with the commemoration date underneath. They were printed in sheets with alternating labels for each stamp. I love his 9th Symphony. A Germany Carl Orff stamp just showed up in my latest gift from Bear. The stamp is not particularly noteworthy, but his cantata "Carmina Burana" is a mind blower, especially in a concert hall. Any concert will likely feature as well a stage production showing some version of the wheel of fortune with special lighting effects. Claudio Monteverdi (1567-1643) was one of the great Italian composers of the late Renaissance/early Baroque. He wrote secular madrigals, sacred music including a superb setting of the Vespers, and operas, of which he was a European pioneer. Here is an Italian stamp issued in 1967 to mark the 400th anniversary of his birth. For the 1985 Europa music theme, France issued two stamps. One was of Darius Milhaud (1892-1974), a classical composer considerably influenced by jazz rhythms. One of the greatest 20th-century classical composers was Bela Bartok (1881-1945). He was strongly influenced by the wild rhythms of Hungarian folk music, and his own works often feature fast jagged rhythms and dissonance: but he was also capable of writing evocative quieter music. He opposed the Nazis and in 1940 fled to the USA, where he became a citizen just before his death. His last works contain some poignantly sad movements. Here is a 1971 stamp of his native country. 1976 was the 150th anniversary of the death of Carl Maria von Weber, best known today as a composer of operas. Here is a West German stamp to mark the occasion, showing three drawings of him conducting. There is a nice socked-on-the-nose postmark. The first half of the twentieth century was a period of very rapid evolution in classical music, and one of the most influential innovators was Arnold Schoenberg (1874-1951), who moved from a late romantic style calling for large orchestras to "12-tone music", which is much more mathematical, and in which (in its purest form) equal weight is meant to be given to the twelve notes of the Western chromatic scale. Schoenberg himself in his later works used the techniques of 12-tone music to great expressive effect. Here is an Austrian stamp for the centenary of his death, SG 1716. The Tchaikovsky Competition for musicians and singers is a major event held every four years. Here is a Russian stamp for the 1962 competition, featuring a bust of the composer. Get you feet tapping. 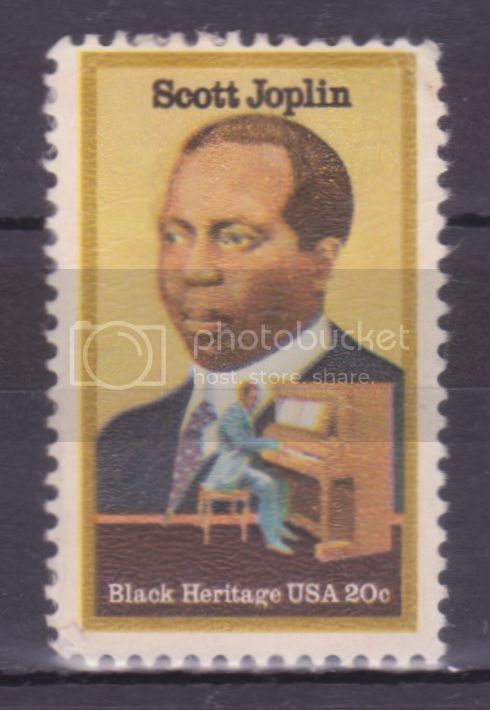 Here is Scott Joplin, king of ragtime. US 1983 SG 20133. 1977 was the 150th anniversary of Beethoven's death. The Maldive Islands issued a set of stamps to mark this. The lowest value, SG 680, shows a rather stiff and artificial picture of Beethoven alongside an organ-casing. In 1781, when he was only 11, Beethoven became assistant organist at the court chapel of the Elector of Bonn, at first as an unpaid volunteer, then paid. It was in this period that Beethoven wrote his first, precocious piano sonatas, published when he was 13. In 1970 India issued a stamp to mark the bicentenary of Beethoven's birth - SG 627. Here the man is, looking wildly romantic and broody, clearly about to hatch an emotional masterpiece. I had never heard of Carl Oorf or Carmina Burana until I received a cover with this stamp on it ... did some research and was blown away the first time I heard the opera! My reaction exactly, sort of like that guy on the left of the wheel above! I have sung in the chorus for Carmina Burana a couple of times. It's a great sing. Mozart on Eire 2009, SG 1971.